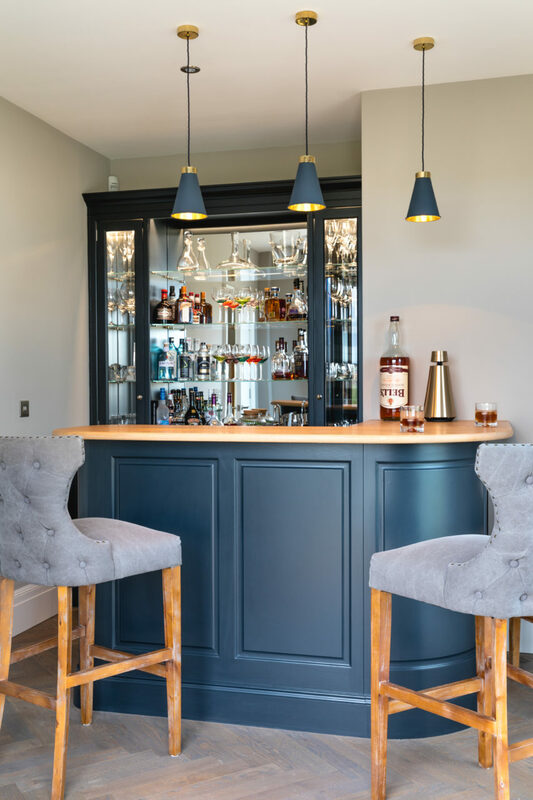 The clients love this little space for obvious reasons, it is situated just off the main sitting room and provides a fun entertainment space that they and their friends can socialise in before or indeed after dinner, seated at bar stools around a very convivial oak topped bar. The multitude of LED lighting bounces off the mirrored glass back and gives the space a delightful warm glow in the evenings and as well as the selection of spirits on display on the glass shelves, a free standing double sliding door bar cooler drinks fridge houses all the beers and wines you could wish for. 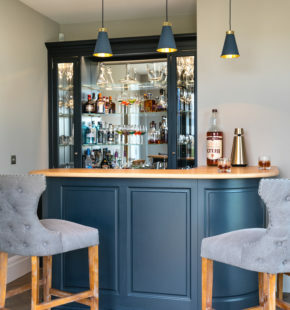 It does not only play host as an evening venue, if it is a warm sunny day the french doors in the snug can be opened out on to the patio and the beautiful view beyond can be admired from the comfort of those lovely bar stools.